Humans are simple beings and have no unique features unlike Ionele and Dasir. Unfortunately, humans are primarily to blame for the prejudice facing Dasir. Ionele are a humanoid race of people that have long ears and are slightly taller than the average human, but still shorter than the Dasir. Ionael are rumored to be a subrace of Dasir, but they lack the red hair gene and fangs. Because of this, many Ionele are capable of socializing with humans, but still partake in meaningless bigotry directed toward the Dasir. A race of people who stand at towering heights. The women average at heights of 6’0″ and men average at 7’5″. All Dasir have red or orange hair, save for a very select few with blue hair, who are descendants of Dasir who were supposedly blessed by the Water Goddess. Additionally, Dasir all have sharp bicuspids, which has unfortunately earned them slurs such as “vampire”, and other related terms meant to demean and dehumanize the Dasir. It is not uncommon for Dasir to file their teeth down or to dye their hair to fit into society. Dasir primarily reside in the protected city-state of Valdis, though there are some that reside outside of the city. The Valdisans are ruled by the Autumn King or Queen. The current reigning King is Casimir Hawthorne. Tellurian Gods have ruled and cared for the country for hundreds of years. They had been watching over the country with a caring eye and were once very social with the citizens of their country. Gifted with many abilities, the Gods graced Tellurians, until one night, one of the Gods mysteriously perished. After losing their immortality and facing an unfortunate string of events regarding the peoples’ loss of faith. Gods, though they still wield intense and unimaginable powers, now have a limited lifespan and have abandoned forms that represent their elements and prefer to roam in mortal disguises. Because of their newfound mortality, they have been passing their essences on to mortals that they consider worthy of becoming Gods. Since then, their miracles have been minimal or nonexistent. However, some still mingle with the “lesser beings” and have even taken them as lovers. A God’s child inherits some of their powers and has an extended lifespan. Their children are either referred to as “demigods” or “partially-ascended”. It’s unknown how many Gods resided over Tellurius at the start, but only seven are currently active. Saligians are harbingers of evil that sleep within shadows of sinful individuals. There was once an abundance of them, but the Life Goddess, Raime, took it upon herself to destroy them. There are only a few left and there few have been able to survive for one simple reason: they’re very powerful. Tellurius is a water-locked country. The majority of the land consists of rolling plains and thick forests that are ripe with life and suffer from very little human pollution ruining the environment. Further up north, there is a mountainous region that houses the Black Valley. 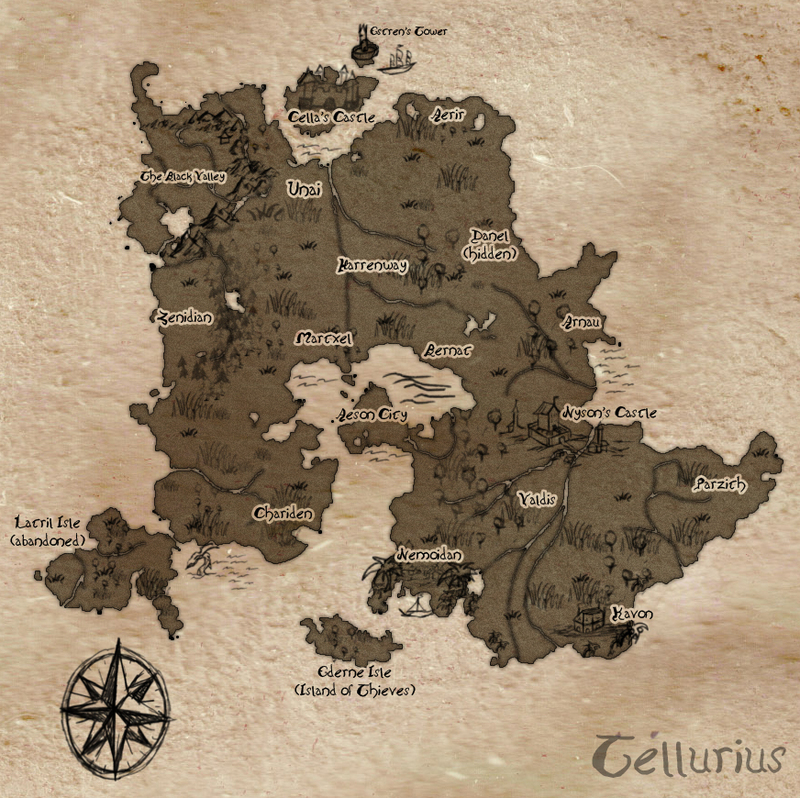 The country is technically built from three territories —Latril Isle, the main island of Tellurius, and the city-state of Valdis that resides inside of Tellurius. Latril Isle’s government and way of living was completely different in comparison to the mainlanders’. They were more primitive in their ways and were much more in tune to nature than the rest of the country. While Tellurius is built on a severely fractured parliament system, Latril Isle was an absolute monarchy. Scaevus’s family ruled over it for generations, making him royalty (at least for a time). Valdis is protected by a massive wall surrounding the city that is heavily guarded at all sides.